I'm using Debian 6 and Dropbox. I followed these commands to install it. When I run ~/.dropbox-dist/dropboxd — Dropbox works and stuff. Problem is that when I close terminal or, even worse — reboot, Dropbox stops working and I need to run that daemon again. How can I have the computer automatically start that daemon in the background? this will detach the process from tha actual terminal and put it in real background. You will still have to start it back up manually after a reboot, though. Here is my solution. This is on Debian 8. Install Dropbox as per standard instructions. So far, I've only got one user connected, I don't know if this will work with multiple users as dropbox seems to register the machine and not the linux user account. If you know how to get multiple user accounts on one server working let us know. Then install the python control script instructions but put it in /usr/bin and not your home directory bin. # locale for all services according to "/etc/locale.conf". # Run `systemctl show-environment` to make sure. You can also run as a daemon by doing daemon $HOME/.dropbox-dist/dropboxd. This has the advantage that if you additionally pass the -n/--name flag, you can use daemon --[running|restart|stop] -n <name> to control the process. You can find Debian and Ubuntu init.d scripts, just copy to /etc/init.d/dropbox and customize with user name. Enable in debian with chkconfig --add dropbox. Then run as any other service. Here is my solution for Linux distributions using Upstart 1.4 and higher. # Dropbox upstart script for user db_user, db_user can be replaced by anything you like. #   Dropbox using Samba. Within group shareusers are all Samba users. # The next line is necessary to be able to synchronise files with non-ASCII characters. NOTE: By uncommenting the setgid line it is not necessary to set the setgid flag on the .dropbox.cache folder as indicated by other sources on the internet. This will start it as a daemon and in detached mode. You would then have to write your own init.d script to have it run as service this way and add a line after #!/bin/bash for chkconfig and add the necessary run levels, such as 2, 3, 4, 5. Different distributions have different run levels so you'd have to check this. There is a fairly nice way to add this to init.d described here. You have to add which users you want Dropbox to start for to the init script (easy enough), and when the system boots, it will start the Dropbox daemon for each of those users. The only thing to note is that they specify DAEMON=.dropbox-dist/dropbox which I believe is incorrect. The author forgot the d at the end of that — it should be DAEMON=.dropbox-dist/dropboxd. I added the following lines to the end of my .profile file. I prefer to have the computer boot at terminal. However, if I start X11 after this, the dropbox applet is not displayed on the system tray. 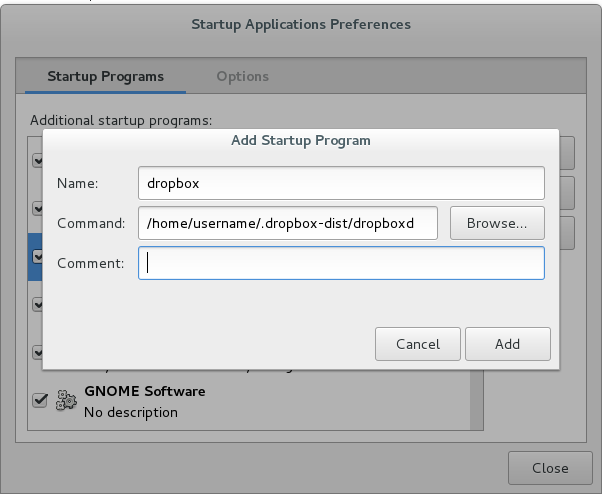 This site seems to have complete information on how to install and configure dropbox on Linux, including downloading and installing the CLI, creating soft links outside of dropbox, and running dropbox as a daemon. The latter provides an init.d script that will enable dropboxd to be controlled with service and chkconfig. Not the answer you're looking for? Browse other questions tagged daemon dropbox or ask your own question. What's the difference between running a program as a daemon and forking it into background with '&'? How to duplicate a daemon? Does fork & exit make a process a daemon?